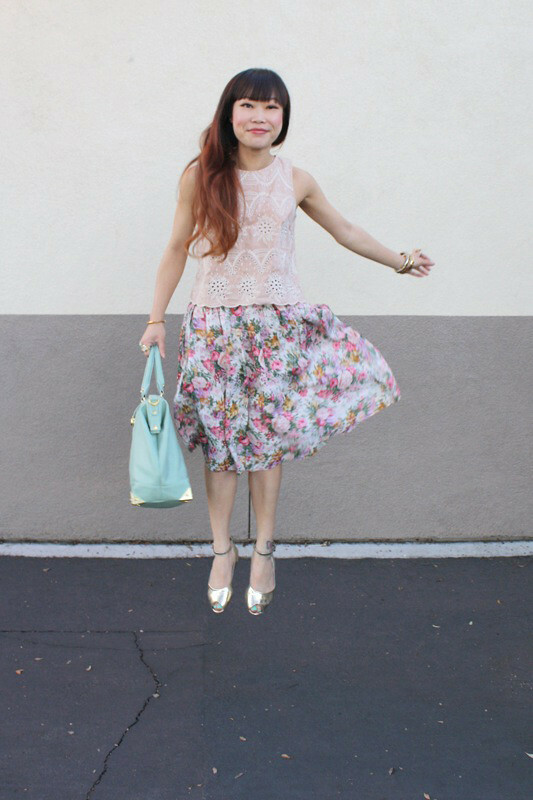 Another flowy and easy outfit, just fresher and girlier. The past couple of days have been really warm and I took advantage of that to wear some sheer and light pieces. I got this lovely mint handbag from my work last week, the color is gorgeous and I love how it is big enough to carry my camera, along with many other things. Eyelet scalloped top and floral maxi skirt paired with a mint purse... doesn't this outfit just scream spring time to you? Eyelet scalloped top by Lush from my work Sway. 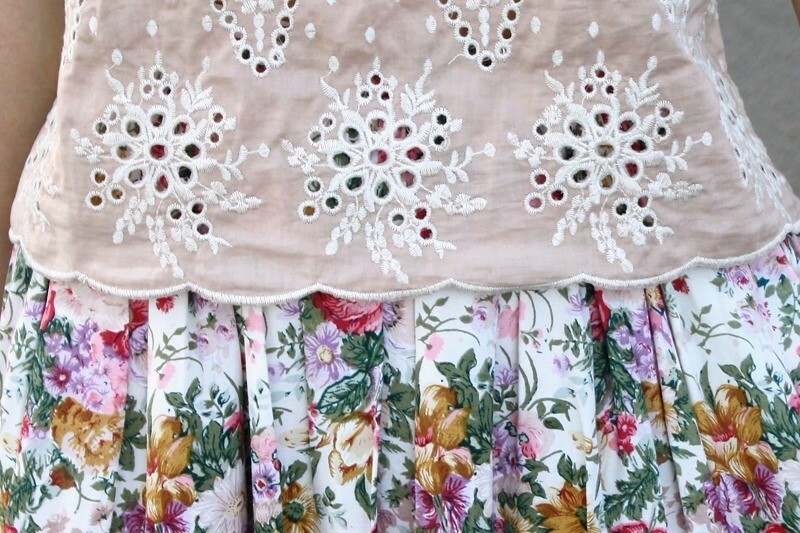 Thrifted vintage floral maxi skirt. Mint handbag from my work Sway. I love that purse! I hope they sell it online. You make such an art of your clothes composition that blow mi mind in a gentle way. I look forward to each and everyone of your post, to see what you come with next. 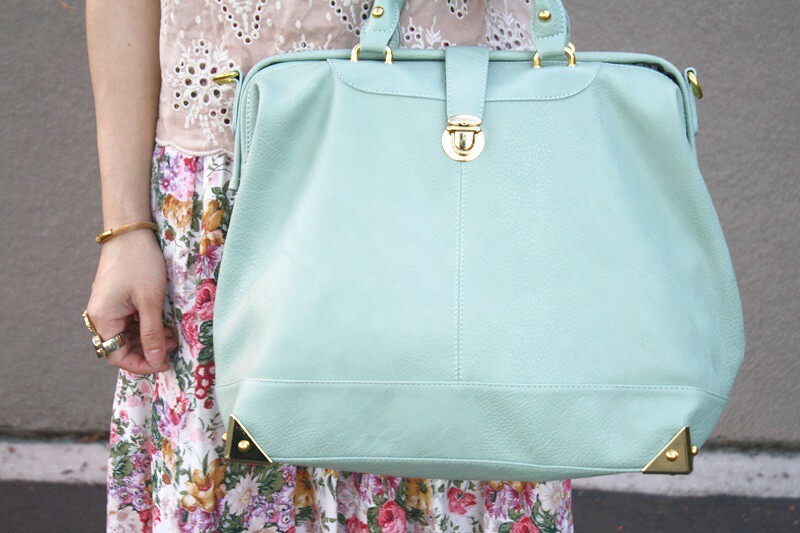 Than mint bag is crazy gorgeous, and so are the gold shoes. I am not at all surprised that you feel like jumping. Ahh that is such a nice top.. soo feminine and gentle looking... perfect for spring! Ooohhh precious bag, love your flower skirt!!! That bag. I'm in love. And the picture of you jumping is just wonderful! Now that looks like a properly useful sized bag. And you look like you just wafted in on a spring breeze! I'm envious that it's warm enough for such floral loveliness. What a dainty little outfit! You have such adorable style! Seriously adorable! I love the jumping pic! omg you have the best bag collection!!! i LOVE that minty bag so much!! Loving the mint bag, so beautiful.